Leone and I are excited about our new digs for our meetings and workshops. Rosemary Cohen has generously offered the use of her Atelier de Paris studio to us. Though we miss certain aspects of Woodbury University, like easy parking and Woodyâ€™s CafÃ© for lunch, we are definitely in a better place. We now have a full studio, complete with ample working space, a full kitchen and convenient water. The bonus is that Rosemary has an all-encompassing store for your fiber art needs. Not only does she carry a full line of DuPont paints and dyes, she has her very own line of dyes and paints: ROCO. We had to cancel our Monoprint workshop due to life getting in the way of our plans. We all wish Mary Beth good health and recovery from her recent illness, as well as condolences for the passing of her mother. It has been a rough haul for Mary Beth. We thank Rosemary Cohen for filling in for the February meeting with a silk painting/dyeing workshop for us. We had roughly 15 attendees, and she was able to give special attention to all of us, regardless of our prior knowledge of painting on silk. Silk is a luscious surface for spreading emulsion. We had a seemingly limitless selection of paints, dyes and advice. I was especially impressed with her â€œpressure cookerâ€ method of steaming the dyed silk. I now have to be on the lookout for a pressure cooker at the Goodwill stores. April is approaching and your Branching Out challenge is due. Bring it in on the 16th. Even if you havenâ€™t finished it. We want to see your progress. We all want to see your interpretation of the theme. We are such a unique group of artists; half of the joy of SAA is sharing our inspiration, interpretations and skills. Mary Beth will present her Monoprint workshop on the 16th. So please sign up, if you havenâ€™t done so already. If you have already paid, send Barbara Weitekamp, wbweitekamp@gmail.com a quick reminder that you have already paid. Call to order by Celeste Covas, Co-President at new location Atelier de Paris. We are requesting that all members update their cell phone numbers. Paper circulated. We want to put all cell phone numbers on the private members web page as it is easier to access on your phone than the roster. Remember that the password to our private page is crochet. Celeste has changed the logo on the web site. Font used is â€œBleeding Cowboys". If you have any comments contact Celeste. The Challenge is due at the April meeting; theme is Branching Out. Check SAA website for specifics. 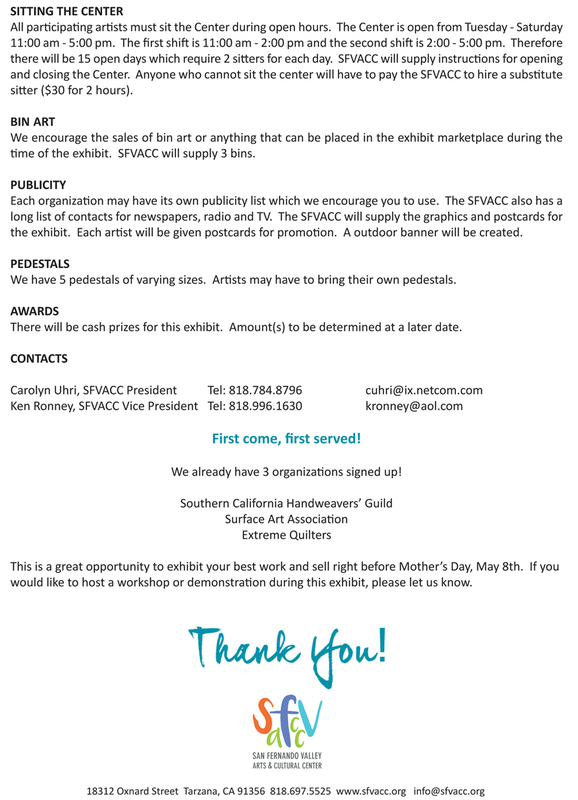 They are preparing to send a proposal to the Blackboard Gallery in Camarillo for 2017. Will inform us re cost etc. Motion from Gerry Ferguson to pursue the Hillcrest Gallery of the Arts across from the Thousand Oaks Mall. Discussion on civic galleries in public areas. The motion was 2nd and passed;. Committee will follow up. Discussed and agreed that committee should continue to follow what is happening at the San Fernando Valley Alliance for the Arts. If a combined show is presented, it may be cheaper for us. The Board thanked Rosemary Cohen for presenting the Silk Paint workshop and a thank you to those members who are taking it . The confusion at the last minute was due to cancellations by the planned metal presenters. We have received 28 paid memberships which includes 4 new members. We are expecting a few more. New promotional postcards were distributed and asked that members leave them in appropriate places. For the period Oct 10 to Dec 31 2015. Workshop ideas discussed: Abstract Composition by John Paul Thorton and a Marbeling workshop which does not need alum by Rosemary Cohen. Diana Shore reported that Shomrei Torad Synagogue beginning October will have a series of Collage workshops and displays based upon CREATION..Asking for participants. Rosemary Cohen volunteered to work with Diana on a presentation. MEETING ADJOURNED followed by workshop. Mary Beth Schwartzenberger will lead participants in a creative exploration of the diverse art form of monotype. 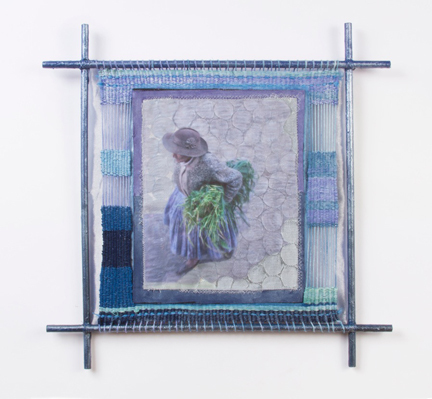 The day will begin with an overview of the process and Mary Beth will demonstrate with examples of her own work. Hands on experimentation will include basic imaging techniques, types of transfers, specific mediums to print with as well as a variety of materials to print on. Participants will also be exposed to stencil work, collage and embossments. Mary Beth will provide printing plates, paper, fabric and inks. Participants are encouraged to bring their favorite brushes or other painting tools, brayers and an apron. This is a Members Only event - but if you are not a member and want to participate, please go to the "Payment" page of the website and join! Morning lecture: Experience a weaverâ€™s journeys to Bhutan, the Peruvian Highlands and Gujarat, India. Explore the significance of textiles in each culture and view several workshops where these textiles are made. Examine a sampling of fabrics from each country. View and discuss three series of artwork inspired by these journeys: Red Offerings (Bhutan) Colors of Gujarat (India) and Majestic Stone (Peru). Workshop: Create a mixed-media/photo collage on cloth based on one of my images or an image from your own journey. The journey could be as far away as China or as close as your own backyard. $40 for members and $50 for non-members. We need to know if thereâ€™s enough interest to book this workshop. We need to fill 18 spots so, we can keep this as a private event. The cost is $125 per person. Artist statement no longer than one page. 4 high resolution photos of your most recent work. Images should be 300 dpi jpg. Link to your own web address, if you have one. One-time payment of $25, by check payable to SAA, or by PayPal on SAA website. If you need help creating a web page, please contact Celeste at celestearc@gmail.com, or Mary Beth Schwartzenberger at rtfuleye@hotmail.com. They will be able to help you with a website page. We hope this will challenge your imagination and tap your creativity and youâ€™ll create a masterpiece for our upcoming exhibition. We look forward to seeing your new work. 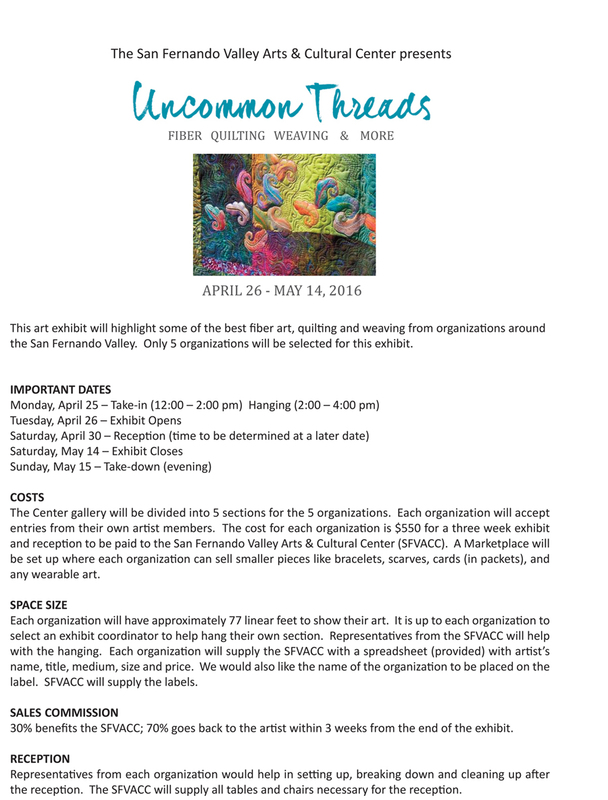 Participants for the SFVACC show Uncommon Threads can bring in their work to the April 16th meeting. We will transport them to the gallery on Monday, April 25. Thank you to the exhibition committee for offering to transport show items.